In the Bible, storytelling is an important means to pass on the revelation of God. God repeatedly commanded the people of Israel to tell his mighty acts to the next generation. Invariably churches follow this mandate and use biblical narratives as a means to transmit God's self-revelation to enable transformation. The author, Dr Annie George, listens to the voices of children in order to understand their perceptions of how storytelling of biblical narratives help them in their spiritual formation. Dr George's research highlights the importance of evaluating the impact of biblical narratives from a child's perspective as well as emphasising the need to give the same priority to the spiritual transformation of children as with other areas of study and ministry. 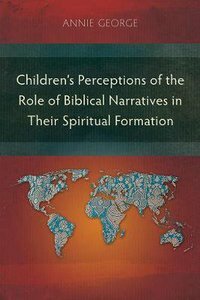 About "Children's Perceptions of the Role of Biblical Narratives in Their Spiritual Formation"